So now that the Union has stopped protesting, since Peter Jackson threatened to move the Hobbit Film to Eastern Europe to shoot rather than keeping it in New Zealand, production is a go. For now. Below are who is cast so far in the Hobbit. You might recognize some of them. Martin Freeman will be Bilbo Baggins. You might remember him from the UK Office tv series, love Actually, or Hot Fuzz. Richard Armitage will be Thoren Oakenshield. You might remember him from the tv shows of MI5 or the BBC Robin Hood Show. Aidan Turner will be Kili. You might recognize him from the tv shows of Being Human and The Clinic. Rob Kazinski will be Fili. You might know him from the BBC soap opera Eastenders. 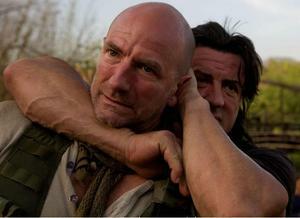 Graham McTavish will be Dwalin. You might recognize him from the last season of 24 or the last Rambo movie. What do you think of the casting choices so far? This entry was posted on Friday, October 22nd, 2010 at 11:21 am	and is filed under Film. You can follow any responses to this entry through the RSS 2.0 feed. You can leave a response, or trackback from your own site.